I took my training run to Kohl’s, did some shopping, then walked back. Christmas is coming! Week 16, Day 4 of training=5 minute warm up, 5 minute race pace + 2 minute walk x 3, 5 minute cool down. This is the first time I have ever followed through and [mostly] stuck with a training plan. A lot of that has to do with the move, a better work schedule, and better weather. I also enjoyed the plan as it mixed things up. New beginnings! Revel Big Bear half marathon is Sunday! My first half marathon since June 2017 and my first since moving to California. Also my first downhill half marathon. Definitely going to take walk breaks to give my leg muscles a chance. (1) I never really thought about myself being a feminist. I was too young (being born in 1963) when, in the 1960’s, the “second wave” of feminism began. (The “first wave” mostly being encompassed by women fighting for the right to vote.) What an exciting yet I’m sure confusing time to be a woman! Some of the basic goals of these feminists were equal pay for equal work, an end to domestic violence, women in managerial jobs, an end to sexual harassment, and sharing of responsibility for housework and child rearing. How sad that 50+ years later, women still are fighting these battles! The “third wave” of feminism began in the 1990’s, and continues to work for equal pay, reproductive rights, and to end violence against women. I am so grateful for all of the brave feminists who fought and continue to fight so I (and my daughters) have a fair shot in life. That’s all we can ask for, and all we expect. Looking at my daughters now, so independent and with fierce opinions on social issues, I guess I raised two feminists. I’m proud to be one too. And how lucky are we to have a President who wrote an essay on feminism that will be published in Glamour Magazine, stating that it is men’s duty to fight sexism. This dictionary definition is spot on, and describes the core of the feminist agenda from day one – equality to men. 1. the advocacy of women’s rights on the grounds of political, social, and economic equality to men. I suppose this post was inspired by recent events. In May and July, I was fortunate enough, in my position as a 261 Fearless Ambassador, to be able to spend some time with Kathrine Switzer at two running events. Kathrine is a true pioneer for women. If you don’t know her story, I encourage you to go to 261 Fearless and read all about her. It is impossible to not be inspired by Kathrine, whether you are listening to her speak to a large group or in private conversation. I encourage all women to join the 261 Fearless movement to get inspired and get moving! As an added bonus, the running event in May was held in Seneca Falls, New York, the location of the first Women’s Rights Convention in 1848 and known as the birthplace of women’s rights. There is so much history to be found here, in additional to an excellent 19k race (special distance for the 19th amendment, giving women the right to vote) and 5k race. May, 2017 will mark the second annual Right to Run event weekend, and will be extra special because it marks the 100th anniversary of New York State granting women the right to vote. Check out Right to Run and join me next May! (2) Glass ceilings were shattered last week as Hillary Clinton became the first woman to receive the presidential nomination from a major political party. You don’t have to support her or even like her to recognize that THIS IS BIG. As of January, 2015, there were 22 female world leaders in power. How is it possible that it took the United States so long? I thought we were such a forward-thinking country, but when I read the negative and downright hateful remarks and comments on social media that have nothing to do with the qualifications of the candidate, but relate to appearance, speaking, etc., it’s maddening. Sometimes I feel like I am being dragged back to the time before the “second wave” of feminism! My hope is that with the Obama presidency and the Clinton nomination, we can continue moving forward, basing our opinions on fact (let’s start using Snopes before we post, people, I beg of you!). Don’t believe everything you read – do your own research and make informed decisions. (3) Lately I am seeing posts encouraging women to run in just a sports bra, shirtless, with the hashtag #sportsbrasquad, challenging women to “shed your shirt and actually enjoy your summer runs”. This “squad” has to do with accepting your body and not being self-conscious, which of course we all need to do. I myself have good days and bad days in that regard. But I don’t need to join a squad or run in my sports bra to make a statement about accepting myself and I don’t have to prove my self-acceptance to anyone. Therefore, I’m declining this challenge, as running in my sports bra has nothing to do with my image of my own body, and frankly it doesn’t sound that appealing to me. I like my running shirts, with their inspirational and funny sayings. I like how my running shirts wick the sweat off me (because I sweat a lot!) so it doesn’t run into my bottoms. I like how my running shirts protect parts of me from getting sunburned, because that sun block does not last when I’m sweating. I like using my running shirt to wipe sweat out of my eyes. I’m comfortable in my running shirt. So I guess I won’t make the #sportsbrasquad, but that’s okay. If you want to run shirtless, go for it! Lots of men do it, and I doubt many of them care what people may be thinking. In today’s world, with all that is happening, we should be beyond the point of this discussion. If you decide to run shirtless, do it because it’s right for you. The key word in self-acceptance is “self”—do what you want to do, what makes you feel comfortable. Make your own decisions. Pave your own path. Don’t wait for someone else to pave it for you. It’s been about five weeks since my car accident, and four weeks since I started chiropractic treatment. I have to say after being nervous at first, I have really come around to the chiropractor. Dr. Steve understands where I am coming from and where I would like to be. He says my spine is staying pretty aligned so we just have to see what’s triggering the flare ups. I can tell things start to go south when I’m driving because I’m nervous, and then of course at work because I am terrible at leaving my desk. I really have to work on that as well as how my arms are positioned when typing. Dr. Steve wants my arms fully supported, where I am old (old old) school with my wrists hanging off the keyboard. I am committed to getting better so I am taking all of this to heart and working hard. One of the toughest things has been the instruction that ice, not heat, should be my best friend. Me, who sleeps with a heating pad on full blast, and visits the steam room, sauna and/or whirlpool as often as possible. Apparently ice is better for inflammation, and heat is better in moderation. I’m not giving up my heat, but I have added a ice packs which I admit certainly are soothing. I have been completing my races as were scheduled way before the car accident. 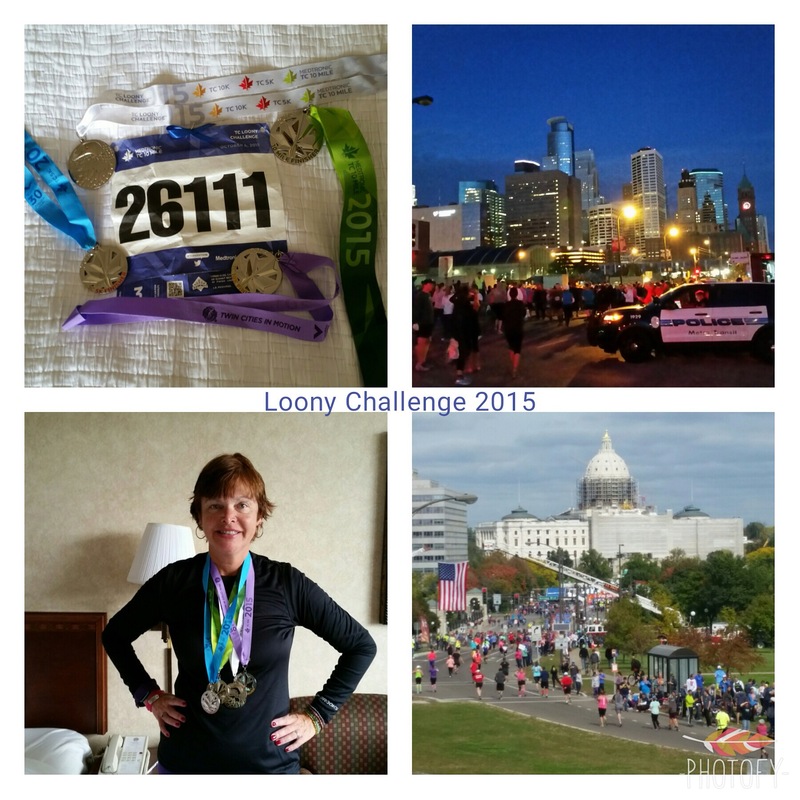 A couple weeks ago I met my sister in St. Paul, Minnesota for the Twin Cities in Motion Loony Challenge. The schedule was a 10k immediately followed by a 5k on Saturday, and the famous 10 mile run from Minneapolis to St. Paul on Sunday. I was pretty nervous to run that many miles in one weekend but it ended up being a huge success. I wanted to keep going after the 10 miles. The only review I can give is if you have the chance to run one of the races offered that weekend, do it! The neighborhoods are beautiful, crowd support is amazing, the races are overall well run, and the medals, shirts, and post-race food are all great. I will be back since I did not run a half marathon, so I cannot check off Minnesota! 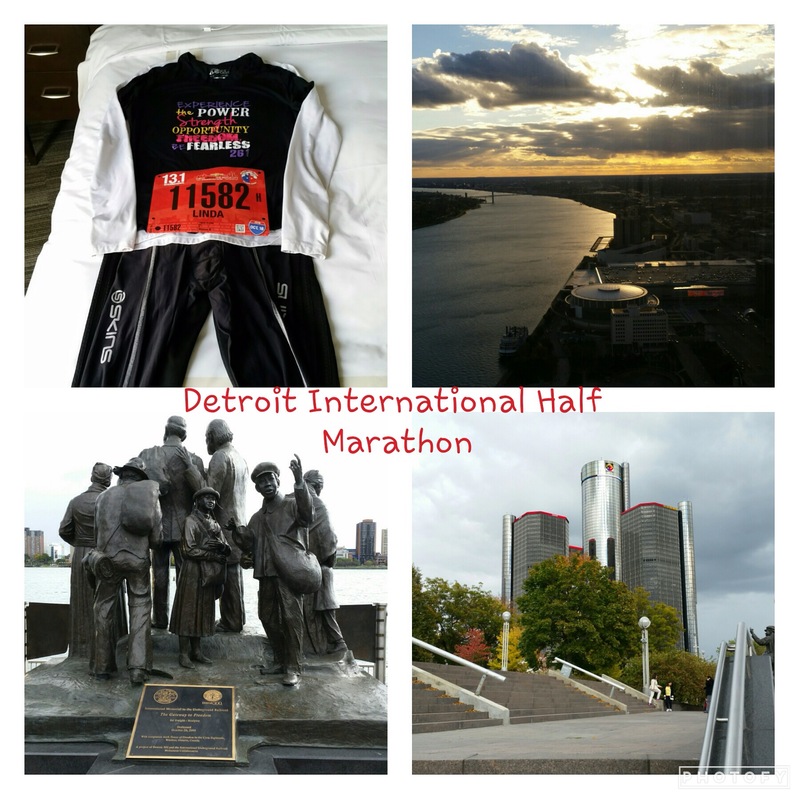 Saturday I drove to Detroit where yesterday I ran the International Half Marathon. 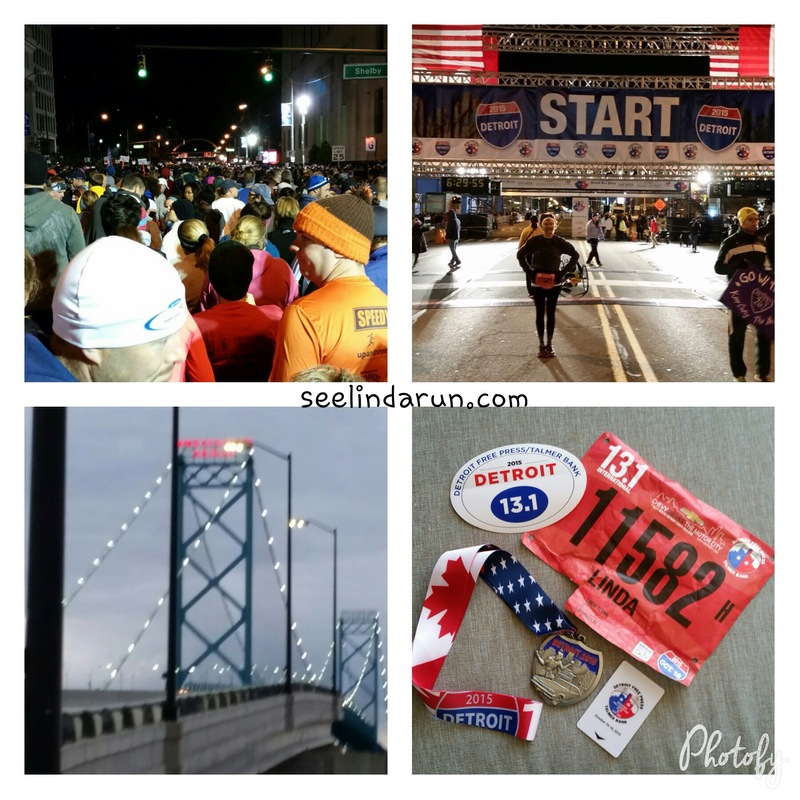 I had heard so many great things about this race, which crosses over the Ambassador Bridge into Canada, then back through the Detroit Windsor Tunnel to the USA. Thus you actually are running under water part of this race. Of course going back and forth to Canada could cause custom issues so you provide your passport info at registration and then receive instructions to keep your bib visible, and be prepared to possibly be delayed if the agents can’t see your bib or if you are carrying liquids. Liquids are allowed but it’s just something that could cause a delay. I only saw one person detained, actually being arrested, and I assume he didn’t have a bib. The agents did a great job and were cheering and high fiving us as well. There were bottlenecks at the bridge and tunnel which reflect in my mile splits, but overall I am really pleased with my time. Crowd support was great on both sides of the border. I love the medal and the shirt. Post race food included bananas and hummus (not a fan), apples and chocolate milk. Pure Protein also had a booth with protein bars. I guess there were food trucks at the after party, but I was cold so didn’t stay. I actually thought the food provided was kind of light especially since there also was a marathon. All in all I’m feeling pretty hopeful. I know I can’t erase arthritis but I’ll do whatever I can to manage it.